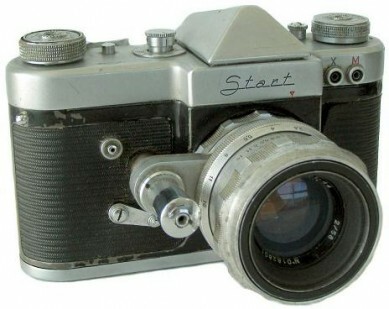 The Start is a very well made and interesting Single Lens Reflex camera manufactured by KMZ. There is a removable back with a film pressure plate made of black glass. 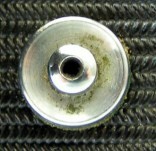 The shutter is made of cloth and travels horizontally. The rewind knob has a film reminder on the top. The rapid advance lever has the film counter on top , is tipped with a small knob. The viewfinder has a dual prism rangefinder in the central focusing area and a removable pentaprism. On the back of the camera is a small round button for the pentaprism lock. There was also a waist level finder available as an option. The Start has a unique breech-locking bayonet for a lens mount. Only the Helios-44 58mm f2 was made in this mount. This lens is unique in that it has an extension of the shutter release built in to provide f-stop automation. There was an adapter ring available to adapt m39 lenses to this camera but no dedicated lenses. The Start was meant use either of two film transport schemes. The film was to be used in the normal manner from cassette to spool and rewind or to transport film from cassette to cassette. The cassette to cassette system required that a mechanism to open the cassettes be built into the back latches and a film knife was also built into the camera. When the rewind button id depressed and the film advance is used in this mode the film is advanced but the shutter is not cocked. This allows the film to be wound into the cassette after use of the film knife (source: www.rafcamera.com). type-0 (1956). Start Preseries. 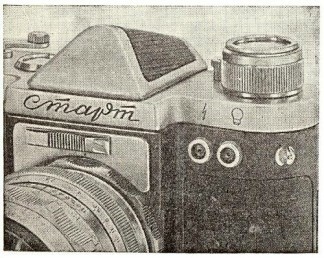 Announced in Sovetskoe Foto magazine No.1, 1957. Old style frontplate; top cover is much less taller; pentaprism housing has leather (or vulcanite?) covering; plexiglass covered speed dial. 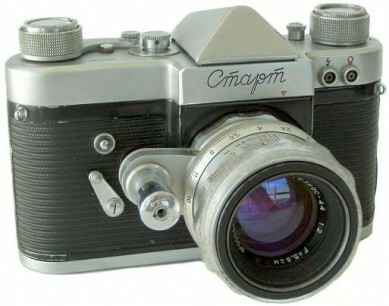 type-1a (1958). An early productional version of particualr camera. Plexiglass covered advance and rewind Knobs; old Gost system shutter speeds: 1s, 1/2s, 1/5s, 1/10s, 1/25s, 1/50s, 1/100s, 1/250s, 1/500s, 1/1000s + B; raised ring around rewind release button; stay-on-top wind lever. 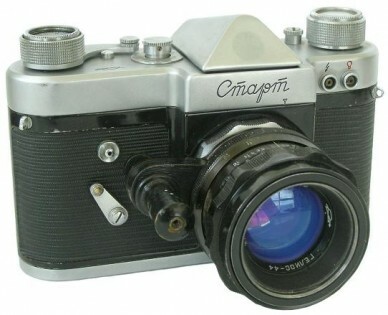 type-1b (1958-1959). Camera very similar to type-1a, but with new shutter speeds sequence already: 1s, 1/2s, 1/4s, 1/8s, 1/15s, 1/30s, 1/60s, 1/125s, 1/250s, 1/500s, 1/1000s + B. 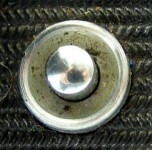 Can be found with/without raised ring around rewind release button. Hollow self-timer release button. Still old design of shutter advance knob. Cameras known: #5800867 (SovietCams), #5801658 (with raised ring and solid self-timer's knob! ), #5900740 (Bill Parkinson). type-1c (1959-1960). Can be found with new design of shutter anvance knob, or with old one. Solid self-timer release button. Black arrow beside the rewind knob engraved. Different form of black synchro arrow on the frontplate. 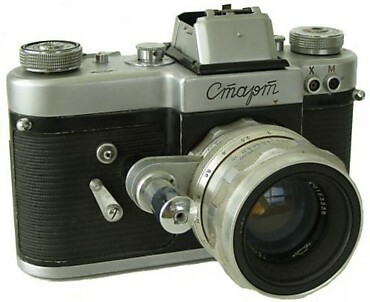 Cameras known: #5902313 (SovietCams), #5902508 (Molotok 2008, old style rewind knob), #6000420 (eBay 2008). type-1d (1959-1960?) Camera identical to type-1c, but with export markings in Roman characters. type-2a (1960?) All metal advance and rewind knobs; stay-on-top lever; hollow self-timer release button; black mirror release button on back. The earliest so far known camera has #6006176 (eBay 2008). type-2b (1960-1963) Version identical to type-2a, but the mirror release button on back is silver. 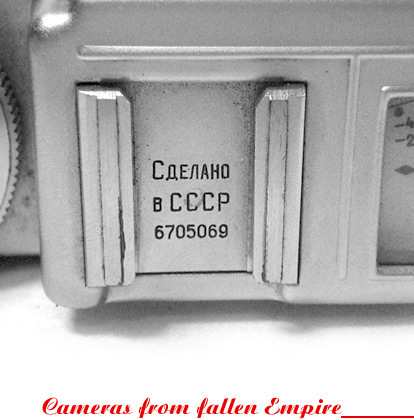 Cameras known: #6115583 (eBay 2008), #6200723 (SovietCams). type-2c (1961-1964?) This version comes with hang-down lever already. Serial number can be found on the left side of the rear plate. Mirror release button on back is gone. Cameras known: #6213749 (Molotok 2008), #6314414 (eBay 2008). 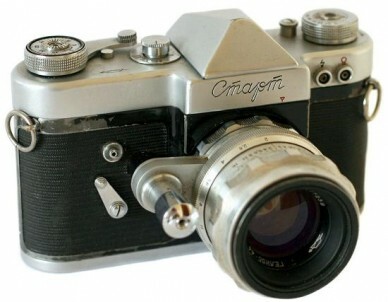 type-2d (1963). Camera identical to type-2c, but with export markings in Roman characters. type-2e (1964). Export Version identical to type-2d, but with plastic tab added on wind lever.